Stark, and dramatic. I wondered if the oblique reference to the Dylan song was intentional: sometimes we don’t need a weatherman to know which way the wind blows. In this photo, even the tree emphasizes the wind’s direction. Of course the Apache plume reminded me of old man’s beard. I didn’t get to see any this year, partly because the land where I always sought it out has been (ahem) ‘improved.’ Maybe next year. The reference to Dylan was unintentional. I probably would never have picked up on it without your pointing it out. shows it going to the California border. In fact I’m noticing now that Austin is near the eastern edge of the species’ range, so I’m fortunate to be where I am and have it around me in such abundance. Good luck coming across some next year, or possibly even this year if you make one more visit to your usual haunts in the center of the state. It took me a minute to figure out that this is a map of old man’s beard, not Apache plume. Apache plume was another one of those species that was trendy among the natives crowd, but I never saw it in the wild. It supposedly grows in some of the parks around Los Angeles, including Franklin Canyon Park (my favorite) in Beverly Hills in Los Angeles County. I am not certain if it was popular in gardening, or if those who liked it just wanted to gets pictures of it for bragging rights. It certainly is pretty in pictures. About five years ago on someone else’s blog I saw pictures of Apache plume for the first time. Until I read the text, I assumed I was looking at some kind of Clematis. Chalk up another instance of convergent evolution, given that the two are in different botanical families. 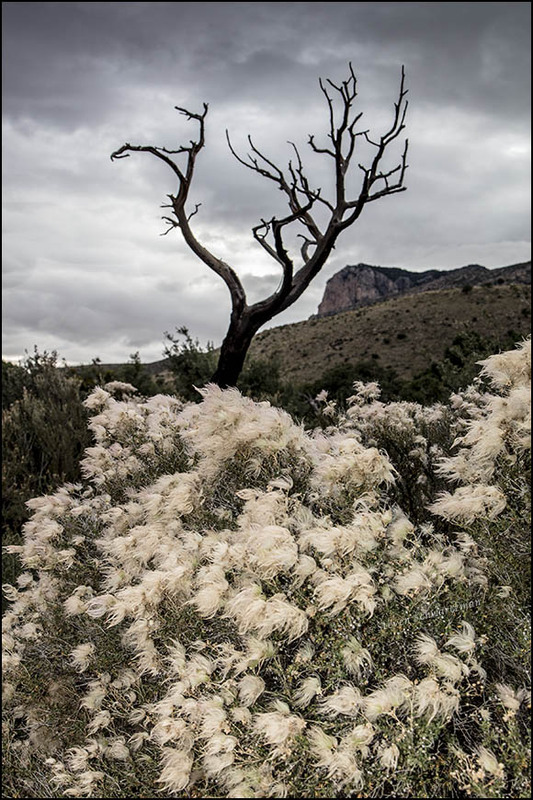 Their ranges overlap in many counties from west Texas through Arizona, so I imagine that some nature photographer has managed to photograph Apache plume and old man’s beard together. Maybe one day I’ll get a chance to do that. I also hope you’ll get to see Apache plume, with southern California being the most likely place, as you mentioned. I will now need to watch for it in Franklin Canyon Park. Many of the natives that get added there are native to California, but not the region. I know it is not botanically correct, but it is interesting. The USDA map shows Apache plume in Los Angeles County. Yes, but like so many regions in California, Los Angles County includes quite a few different regions. Specie that are native to the Mojave Desert are not the same as those that are native to the Santa Monica Mountains. Lucky you to have such diversity there. It certainly is excellent. When I went to Oklahoma, I was amazed that the same species of plants that we encountered before we left Texas were the same that we saw everywhere we went in Oklahoma, no matter where we went. They were everywhere, and stayed everywhere until we left. I seemed so odd that the main part of Oklahoma (without Cimarron, Texas and Beaver Counties) had less variation of climate than the relatively small Santa Clara Valley, or the Santa Cruz Mountains, . . . . or any part of California. I go through more climate zones between here and town! I think I mentioned once that when we stayed in San Ramon on the California part of this trip we had to get different weather forecasts for places we were planning to visit not far away. My former home in town was in the rain shadow of the Santa Cruz Mountains. I got about a foot of rain annually. On the outer slope of the Santa Cruz Mountains, just a few miles away, I got about two or three times as much rain. Thanks, Terry. This view and later the sunset were my compensation for not getting to see fall foliage in McKittrick Canyon. The tree branches, though I assume they are static, seem also to be caught in the force of the wind. You may not have got the foliage or weather you were hoping for, but you sure got a photograph full of drama. How interesting that Linda (shoreacres) and you both inferred wind movement in the tree, while I always saw the tree as static. Maybe that’s because I was there and knew that the tree didn’t actually move. You’re right that what I got compensated for what I’d hoped to get. This and the sunset a little later proved a worthy end to our great trip. The next day we drove straight home and I didn’t stop for a single picture. You’ve gotta go to the American West (just like Americans need to visit New Zealand). We intended to visit this National Park during a trip to Carlsbad Caverns a few years ago, but sadly had to abandon our plan due to a wildfire that had started just a day or two earlier. I hope we will make it there one of these days. According to many predictions, wildfires likes the ones that have been ravaging California will be the “new normal.” I think that is extremely concerning, yet there are still people who claim that the climate is not changing. I feel sorry for the people who lost their homes in California these past two weeks. I know someone outside Austin whose house burned down during the drought of 2011. Homes and lives! It seems unreal to ponder all the implications. It is very, very sad. Friends in two other towns were more fortunate during the wildfires of 2011: fires burned right up to their properties but didn’t reach their homes. Good for them, but I have heard interviews with people in similar situations, and they are not infrequently tormented by guilt for being spared. Yes, I’ve heard about so-called survivor’s guilt. I just watched an episode in a PBS series about coastal cities taking measures against rising sea levels. Tonight’s show was about Miami. The other two episodes we’ve seen dealt with Tokyo and London. Venice has been trying to protect itself for decades, and I don’t know how close they are to succeeding. The predictions for countless low-lying areas are dire. I expect some (or many) places will eventually have to move inland. I expect you might be right, Steve. One reason we don’t know more about some ancient peoples is that the coastal places where they lived during the last ice age got submerged as the ice melted and the water moved inland. We have archaeological remains from some of the places they moved to but not from the formerly coastal zones where they had lived. Stunning photo. The Guadalupe Mountains are one of America’s hidden gems. You’re right: I think most people have never even heard of Guadalupe Mountains National Park. It’s much less well known and much less often visited than the other national park in Texas, Big Bend.